So can you believe this? Bruce Springsteen scholars from around the world came to "Glory Days: A Bruce Springsteen Symposium" in West Long Branch, New Jersey this weekend to examine Springsteen's music from an academic perspective. Now why in the world would anyone spend a bunch of time analyzing a rock star's lyrics and infleuential impact? "If you're sad, happy, angry -- if you want to scream, rant and rave -- there's always a [Springsteen] song that can express it", said Patty Pappas of Toronto. 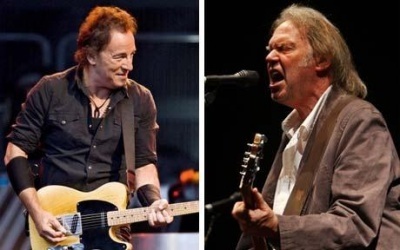 "Bruce's music can call us to a higher purpose," said Dr. James Kelly of Carlow University in Pittsburgh, calling Springsteen a vehicle for discussions on social causes, war, race, gender and class. Discussion topics were dizzying. Springsteen and psychology; the movies; spirituality; American culture; history; the criminal justice system; the online community; family. Bruce Geeks worship Springsteen as a storyteller and a poet. References abounded to the likes of writers Jack Kerouac and Flannery O'Connor; Springsteen has said O'Connor's work helped inspire the "Nebraska" album. The "Springsteen and Social Consciousness" panel stressed that the boss puts his money -- and his energies -- where his mouth is. Singer-activist Jen Chapin, daughter of the late Harry Chapin, said Springsteen has raised millions of dollars for grass root causes including hunger. "I've dealt with a lot of celebrities," said Chapin, giving Springsteen an A-plus for his "integrity" and determination to "follow through on his promises." "Bruce and his music, through his lyrics as well as his performances and his social consciousness ... speak to the common man or woman," Bernhard said. "He resonates with many of us" -- in all walks of life. Well. Imagine that. Following a musician because of their "integrity"? Lyrics that are "a vehicle for discussions on social causes, war, race, gender and class"? "Worshipping a storyteller and a poet"? We understand there will be an international symposium held on Neil Young in October in California. Know anybody going? Thrash, you really amuse me sometimes. You LOVE to incite debate and you just know your gunna get bites with all the "burley topics" you cast out. Everyone is going to saviour the different tastes, even though the ingredients are fundamentally the same, but you'll all know which cuisine is which, no matter how diverse or subtle. but wouldn't it be boring if we ALL just liked Thai...that's the beauty of life..everyone has different tastes, ideals morals ,ethics, political leanings and fundamentals and that's whats great about life and people. until I graduate with a DIP ed! Young versus Springsteen, huh? Funny how the "future of rock and roll" didn't quite turn out that way. I won't be ashamed of love." Watch Bruce get schooled while these two do 'All Along The Watchtower.' See it on youtube. he gonna rate your record high! What is wrong with some of you NEIL ZOMBIES? Now all of a sudden Springsteen can't write lyrics, at least not as well as Neil. Neil is my favorite artist, above everyone else, but to say Springsteen can't hold a candle to him is CLOWN-LIKE. And to cite lyrics from Philadelphia as Exhibit A is hog-wash. It's a curiosity this need to study the lives and lyrics of our balladeers. I remember that Time article hailing Springsteen as the new Bob Dylan for the mainstream. And so he ended up fulfilling their prophesy, didn't he? But nothing ever as glorious as that ever propelled Neil's career into the mainstream, did it? With few exceptions of making the cover of Rolling Stone, people didn't expect much of Neil or think he would have the international spotlight that he has today. Neil is self made. Bruce is industry made. Bruce played the game and won the lottery. Neil did not play the game but still won the lottery. Both men took different pathways and ended up in the same spot light. There were quite a few other interesting comments on Bruce & Neil, as well. Thanks for stopping by while you're on the run. Wow, anonymous, I guess you told me. You're completely right, of course, Springsteen is a classic. Clearly, future generations of pop music aficionados will be listening to "The Rising" and flocking to symposia on the Boss' music. In the future, anonymous, I'll keep my clown-like comments to myself. you made an idiotic statement. Deal with it. You said Bruce can't write lyrics on par with Neil, citing Philadelphia as an example. i told you otherwise. Again, deal with it. Meanwhile, switching gears, Neil hasn't been exactly Mr. Anti-Corporate America of late. He typically charges among the highest concert prices in the industry (OK, 3-2-1....waiting for a wise-guy to claim it's all the Promoters fault and/or Ticketmaster. Again, 3-2-1...tic-tic-tic). Neil likes his greenbacks as much as the next guy....and i don't necessarily have a problem with that; i just have a problem when people make Neil to be the greatest thing since sliced bread. Be objective, people. Just ignore commenters that start off with "Neil zombies". Definitely a sign of a 4% Club member. A better analogy would be Sinatra is to Springsteen as Seeger is to Young. Both are classics in their own right, for their own contribution to music. Remember when everyone went haywire on Nebraska? Springsteen always wanted to be Seeger, but his fans would never let him go down that road. They want Sinatra not Seeger. They want Superbowl. They want Vegas. "...Neil will always remain outside the mainstream only until he chooses not to be......"
He plays at all the popular arena, charges huge dollars, appears on all the TV Shows (letterman, Conan, Charlie Rose etc). Pretty Mainstream to me. "There is the story of the politician who accused a follower of never being loyal. The follower was nonplussed. 'But I always support you when I think you're right,' he said. 'Anyone can do that,' said the politician. 'I want people who support me when I'm wrong.'" Good points, especially Nebraska. Lot of folks had problems with Ghost of Tom Joad too. Too folky and bleak. I've always felt that Bruce's career was run by managers & agents. And playing the Super Bowl was just another in long line of sellouts. You do have to wonder how many times Elliot said Neil do X and he went and did Y. Thanks, man. I love this place and what you've created. Thanks for encouraging diversity of opinion. 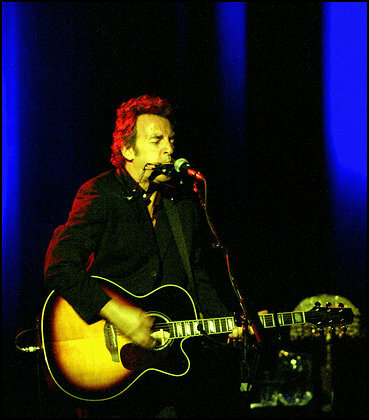 Regarding Bruce, he is a great songwriter and performer. No doubt about it. Anyone who can sell out stadiums and play balls out for 3+ hours, earns my respect. And to be fair, Neil has written his share of clunkers over the last 40 years. My own sense is that when it comes right down to it, Neil just wanted to be a folk singer. When he says that played "Four Strong Winds" over and over as a kid and that it was the best thing he'd ever heard, I take that at face value. For me, Neil's music, good or bad, has a universality that speaks to me. "Cortez," with its three chords played repeatedly for 10 minutes, takes me to a different place every time I hear it. "Born to Run," not so much. Bruce's music, good or bad, just doesn't speak to me. Simple as that. He plays at all the popular arena, charges huge dollars, appears on all the TV Shows (letterman, Conan, Charlie Rose etc). Pretty Mainstream to me." Neil has no control over how much people are willing to pay for tickets. All the times I've seen him the venues were small. Yes, being in demand requires musicians playing larger venues like MSG, but that's the exception for Neil. Not the rule. As far as appealing to the mainstream, Letterman, Conan, Charlie are not mainstream. Most of the population are sleeping when they are on. If they were mainstream, they'd be competing with Oprah & Jerry Springer. When was the last time Neil was on Oprah or the View? The mainstream is popular culture & music. Stuff that everybody is doing. I don't think any of Neil's stuff ever came close to being "popular." He's been an oddball of sorts. As long as I can remember. I don't think Bruce ever had that "distinction." Only when he did Nebraska. Man, people were ready to riot in NJ. At this level of accomplishment, comparisons are fun and interesting.....but which I prefer today depends on my mood today. To only listen to Neil (Which I have done for days and weeks on end) can get you in a funk. Variety my friends. The spice of life. The article is interesting and certainly deserving of comments as demonstrated here. I agree, variety is best but we can have our favorites, too. Right? Bruce is a very good lyricist and poet, too. He's up there with the rest. And probably deserving of this special distinction from academia. Although I've never heard of scholars gathering for Neil like this, they have been been tearing apart his song's since I was in college ages ago. Powderfinger, for one, appears to be the favorite of a good many English teachers and lecturers. That is a masterpiece. Bonafide. Anyone else had the pleasure of hearing their teacher lecture about Neil's stuff? ".....Neil has no control over how much people are willing to pay for tickets....All the times I've seen him the venues were small. Yes, being in demand requires musicians playing larger venues like MSG, but that's the exception for Neil. Not the rule....."
BaaaaaaaaaHaHaHaHa! Some of these Neil Zombies really have no clue! Neil has been playing Stadium Shows for DECADES! That's right - Decades!!!! The first time i recall, purely off the top of my head, was 1973 when Neil played lots of Hockey arenas. The tour went so badly for poor Neil he had to call in Crosby and Nash to help with the vocals. Only a year later, 74, Neil and the boys (CSNY) played the biggest tour of all time (at that point in history), The Door Tour. Why'd Neil play it? Cuz he could make A LOT of money, among other reasons. Since then, over the prevailing 3 1/2 decades, Neil has played plenty of Stadium tours. I wouldn't necessarily call it the exception; it is very common at this point. Fortunately, Neil also can play an intimate show at a small theater, bless his soul. When Neil gets inducted for Sainthood, i'm sure the Zombies will let me know. Actually, now that i think of it, Neil is GOD, as pure as snow! Bless his heart for having nary a capitalist thought in his brain! Come on man...use yer head! Neil IS WAAAYYY more of a poet and has way more integrity than Bruce! Don’t kid yourself! I'll take Dirty Old Man over the Rising any day! Neil has always stayed true to himself and has always embraced the underground- that alone makes Neil cooler. Has Sonic Youth ever opened for Bruce? Bruce is great too and I love him but Bruce is a rock star. Neil Young is an Artist! I wish Bruce would do more Nebraska type stuff. He broke up the E-street band- obviously he'd had enough. His sales tanked and management made him resurrect e-street. I somehow don't think Neil would EVER do something like that! Neil would hate this conversation. Bruce would be rooting for himself. Speaking of academic Neil anyone ever read ‘Neil Young and the Poetics of Energy’ by William Echard? Cool book but it’ll melt yer brain! in 74 neil's voice went out and needed help from Crosby and Nash. Neil prevails! Neil is better! It was '73 when Neil called in C/N, the Time Fades Away Tour. Neil had a bad throat in '76 and quit on the remainder of the Stills / Young Tour. BTW - Neil charges top dollar for his concerts. JUSTIFY THAT! Saw Bruce last year...paid $250. Same as Neil the year before that. saw him later that same year...paid $75. and was front row center. I've seen Neil about 15 times- he has never once canceled on me. By the way... Neil quit the Stills Young tour cause he was sick of Stills and went to play with crazy horse. Man this guy! Go away! Blu-ray is a bust to impatient, whiny babies like you. Why did you spend the money if you hate Neil so much? Why do you come to a Neil fan site to bash Neil? Are you that bored and lonely? Think about how sad that is. I feel bad for you actually. Need a hug? the OFFICIAL line in 76 was that Neil had THROAT problems and quit the tour. i thought you ZOMBIES believed all the official Neil lines? PS - Thrash, you throw up a post about Neil, and you don't expect people to debate it? Oh, I see, you can debate it, but only if you're only 100 percent PRO NEIL. I don't think anyone believes all the official lines. I'm going by what I remember. I saw Neil at both big and small venues between 72-76. The big venues had the top bands of the time and the small ones were with just Neil & whomever his eclectic band mates were at the time. I even got to see him when he toured with Stills. Back then we didn't care what was going on between Neil and CSN. We were there for the music. What I noticed is that Stills couldn't sing or play if his life depended on it so his harmonies with Neil were a drag to listen. Even Crosby & Nash sounded dated and out of tune with songs they still do while on tour. I was lucky to witness new material from Neil Young. Like people today, there were people back then screaming for Neil to do his "populars" and sometimes he did and sometimes he didn't. As for Bruce's concerts, I wouldn't be caught dead at any one of them. It's like watching Tom Jones. It's a Vegas act with him bumping and grinding. The only time I enjoyed Bruce's music is when he played at Public Sq. in Cleveland. He was awesome. So call us Zombies if that makes you feel better. This hear debate.....beating a DEAD HORSE. There is no photo finish, there can be no ultimate winner. No roses. No trophy. Aren't they both HUGE? Don't they both say the other is great? As for the roads travelled to get there, they had to be different. One's from the north the other from the shore. Sellout? yup, their shows usually sell out. "It takes a clear mind to make it"
"In the long run it will make you cry.Make you crazy and old before your time.And the difference between me and you. Trash, you are a piece of Crap, a pathetic Zombie. you incite debate on Bruce vs Neil, and when it's not 100% pro-Neil, you CENSOR. you my friend are a FRAUD! Here's the definition of a zombie. Someone who comes on this site continuosly and calls neil music lovers zombies. It was a piece of crap"
Now that's poetic superiority. Worthy of a symposium!! C'mon you anon's. Stand up and be known. Identify yourselves and be heard. 2b; a person remarkedly strange in appearance or behavior. That's us.